Markman Capital Insight LLC has partnered with several prominent brokerages and research firms to help insure that customers have the optimum investing and trading experience. It is common for futures traders to hire a professional broker to trade systems such as Gemini on their behalf through a "letter of direction." The extra cost is minimal, amounting to low commissions only, and the level of service is excellent -- fast, efficient, friendly and helpful. Futures brokerage in Chicago that provides auto-trading or broker-assisted services to Gemini 252, Gemini SGX, Gemini VF1 and Gemini TY customers. Ask us for a broker referral. Futures brokerage in Chicago that provides auto-trading or broker-assisted services to Gemini 252, Gemini SGX and Gemini TY services. Ask us for a broker referral. 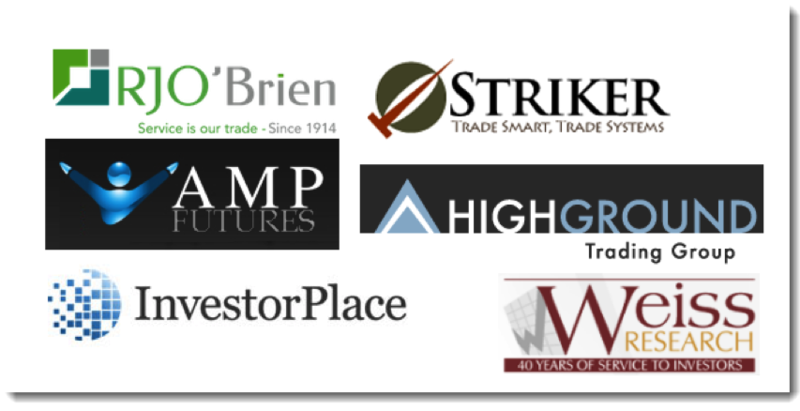 Major investment research organization based in Maryland that publishes two of our services, Traders Advantage and Counterpoint Options. Analysts at Markman Capital Insight create, write and edit these two newsletters; Investorplace manages the customer experience and marketing. Major investment research organization based in Florida that publishes one of our services, Tech Trend Trader. Analysts at Markman Capital Insight create, write and edit this service; Weiss Research manages the customer experience and marketing.